One of the missiles was fired at night and destroyed what Israeli media said was a target similar to Iran's long-range Shahab-3 missile. Israel has considered Iran its greatest threat since the overthrow of Saddam Hussein in Iraq in 2003, analysts say. "This evening's successful test reinforces Israel's readiness... against external threats at the extremes of its operational envelope," said Israeli Defence Minister Amir Peretz. 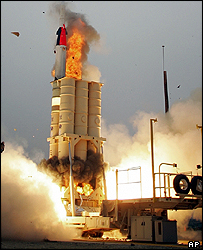 The Arrow missile was fired from a base south of Tel Aviv at a missile launched from an aircraft over the eastern Mediterranean at a high altitude. This was the first test of the Arrow missile to be conducted at night. Israeli public television called the test a "message to Iran". Some Western nations, including Israel, fear Iran is trying to develop nuclear weapons.